Adventurer! This Rifts® Essentials Bundle, revived (for a second time) from July 2017, once again presents the core rulebook and key supplements for Kevin Siembieda's Rifts tabletop roleplaying game from Palladium Books. This bargain-priced revival is your starting point for a campaign of mind-blowing adventure across a future Earth shattered by countless otherworldly invasions. Once you have this Essentials collection, check our all-new companion offer, Rifts Phase World®, featuring the standalone sub-setting of space opera adventure across the Three Galaxies. 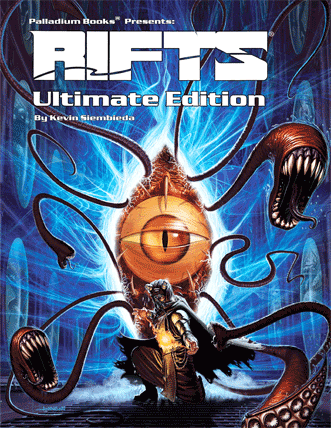 For just US$8.95 you get all three titles in this Essentials offer's Starter Collection (retail value $33.50) as DRM-free .PDF ebooks, including the complete 384-page Rifts Ultimate Edition™ plus the Rifts Primer and Rifts Sourcebook One™ Revised Edition. And if you pay more than this offer's threshold price of $20.34, you'll level up and also get this offer's entire Bonus Collection with three more supplements worth an additional $45.50, including the Game Master Guide, a 360-page equipment collection; the Book of Magic™; and the Game Master Kit with useful play aids and pregenerated characters. Learn more about our offers at our official blog, Beyond the Bundle. Ten percent of each payment for these two Rifts offers (after gateway fees) goes to the charity designated by Palladium Books, the National Center for Missing and Exploited Children. ...But you pay just $$8.95 for this offer's Starter Collection of three complete .PDFs, including the Rifts® Ultimate Edition™ core rulebook, the first sourcebook, and the Rifts Primer introduction to the setting. And if you pay more than this offer's current threshold price ($$20.34), you'll level up and also receive all three titles in this offer's Bonus Collection, including the Game Master Guide, the Book of Magic, and the GM Kit with pregenerated characters and useful record sheets. Don't forget our all-new Phase World Bundle featuring the cross-dimensional space opera setting for Rifts. To keep the starting threshold price from rising too quickly, we calculated it based on 400 fake sales at $19.95 each. The tabletop roleplaying ebooks in this Rifts Essentials Bundle offer retail for US$65.50. Choose a price you like, in US dollars (minimum $8.95). Make sure you choose an amount greater than $20.34 to LEVEL UP and gain the bonus titles. Just a note: This amount is below the threshold price, so you're receiving only the starter collection. To LEVEL UP and get the BONUS collection, please choose an amount more than $20.34. You're sending a gift! First tell us your email address, then the gift recipient's email address. We'll email you an order confirmation, and we'll email the recipient a gift code. You can set the code's arrival time. The recipient can redeem the code here. Gift bundles always include the bonus titles! Would you rather send this current bundle as a gift? Select the "LINK" button below. Give a GIFT CODE good for one future bundle of the recipient's choice. Send a LINK good for this specific bundle running right now. You're sending a gift! First tell us your email address, then the gift recipient's email address. We'll email you an order confirmation, and we'll email the recipient a link to redeem this offer. The link will work even after this offer has ended. Gift bundles always include the bonus titles! The email addresses you entered do not match! When you complete your purchase, we'll email you to tell how to create your account and visit your Wizard's Cabinet download page. Do you already have an account with us? Please double-check the address you gave. Better yet, log in to your account. That autofills your address. You're ordering the Rifts Essentials Bundle with the account . Right? You're paying $, to get the complete collection only the Starter Collection, not the Bonus Collection. Your generous payment qualifies you for our leaderboard, where your name will appear as . Right? × It looks like you've already purchased this Rifts Essentials Bundle offer with your account address . Thanks! Please log in and visit your Wizard's Cabinet to download your files. Is this right? We found a problem Welcome! Congratulations! You've redeemed your gift code for a FREE Bundle of Holding! In a moment we'll take you to the confirmation page with all the details. These payment processors accept all major credit and debit cards. PayPal also supports payments from your bank account. The payment processor deducts a fee from your payment before we receive it. Your credit or debit card statement will show "BundleHolding," "Bundle of Holding," or "BookBundle," depending on your payment processor. Then visit your Wizard's Cabinet page, link up with your DriveThru library, and start exploring the shattered Earth. Three centuries in the future, our shattered Earth is recovering from the Great Cataclysm -- an event that wiped out human civilization, brought the return of magic, and made Earth into something both familiar and alien. To survive, humans transform and augment their bodies with bionics, robot exoskeletons, psionic-inducing brain implants, chemicals, and magic. Holes torn in space and time -- the Rifts -- are doorways to anywhere, connected to countless worlds and realities. From the Rifts have come ancient gods, demons, and magic. You are one of the champions, the heroes of mankind, or an explorer or truthseeker who braves the savage wilderness and dares to face the dragons, aliens, and weird creatures from the Rifts. The 376-page Rifts® Ultimate Edition™ is a complete RPG of science fiction and adventure. Play any of more than 30 unique player character types, including mutants, dragons, Crazies, Juicers, Glitter Boys, Cyber-Knights, Ley Line Walkers, Bursters, Psi-Stalkers, Mind Melters, and more. Select super-science, psionic powers, or magic as your weapons of choice, and augment your abilities still further with power armor and human augmentation. Learn much more at the Palladium Books website. Rifts® Primer (retail $3): Carl Gleba and Kevin Siembieda join forces to create a tour de force of information about Game Mastering games and creating adventures. This 43-page primer (from The Rifter® #75) helps both GMs and players enjoy the storytelling experience of roleplaying games, as well as helping them better understand the game rules. The "Rescue the Rogue Scholar" adventure guides aspiring Game Masters through the creation of adventures and plot. It's 100 years in the future. Humankind has enjoyed a Golden Age of peace, prosperity and advancement. We've conquered most diseases, bottled the fountain of youth, extended our life span to 200+ years, and our toys are nano-technology and the genetic code. Our cities look like something out of a science fiction novel complete with robots, androids and flying cars. Our future appears grand ... then it all comes to a crashing stop. Imagine the end of the world. The movie Day After Tomorrow meets Nightmare on Elm Street. In addition to the mass destruction and total chaos, lines of blue energy appear across the world. Where two or more lines meet, tears in space and time occur. From these Rifts emerge strange, alien beings. Some seem as mortal, scared, and confused as you. Others are demons from the very pits of hell. At other places along the lines, weird and alien wildlife appear overnight. People start to manifest magical and psychic powers, ancient gods appear to claim portions of the land, titans clash, and the landscape changes. It is pure and utter madness. It's the planet Earth, but one you'd barely recognize. It has been transformed into a patchwork of a thousand alien worlds with doorways to infinite realities. Imagine each State, Province, and Country an alien environment. One place may be a beautiful woodland, another is an alien jungle, another is dominated by humanoid insect people, another is filled with dinosaurs. Over there is the land of faeries or dragons. Over here is a place at war with itself. Some lands shift and change daily, while others straddle two or three realities at the same time. At one location, people thrive locked away inside a massive fortified city of technology. Robots and black armored sentinels patrol its streets and strike down anything that isn't human. At another location is a city of magic and wonder. Dragons and a hundred different alien races live in harmony with human beings and share the secrets of magic and alien science. Across the sea is a land of wonder, magic and monsters who trade in alien technology, dark magic and human life. Elsewhere are vast reaches of forested wilderness. Within its shadowy confines are barbarian tribes, aboriginal people, aliens, and monsters. Another stretch of wilderness is dominated by dinosaurs and elsewhere, castles in the sky drift over grassy plains and bands of monster riders. Beyond the haunted mountains ... who knows? The lines of blue energy have calmed down and the Rifts are no longer a daily occurrence. Still, they open at random intervals throughout the year to unleash new alien beings or monsters into our world, or serve as portals to a thousand planets waiting to be visited. Some people have come to accept and embrace magic, some wield superhuman psychic abilities, while others rely entirely on advanced or alien technology. To cope with the harsh environment, humans have rediscovered some of the wonders of the Golden Age and use bionics, suits of power armor, giant robot constructs, and chemical augmentation, or have turned to magic and other means to tum themselves into supermen. Now imagine being able to travel to countless alien worlds and civilizations. Not in a rocket ship, but by simply opening a Rift in space and time and stepping through it. Welcome to Rifts Earth, the intersection to the infinite Megaverse. A bus stop where dragons, gods, and dimensional travelers come to find or create a dimensional door to wherever it is they want to go. A nexus to the Megaverse like Rifts Earth is a rarity. So rare that the god-like powers and galaxy conquerors have all, unofficially, taken a hands-off policy, leaving humans and the other displaced alien people to fend for themselves. Thus, humans struggle to reclaim the world, battle against alien, magic and supernatural forces, and learn to live with displaced alien people as mortal, frightened, and vulnerable as they -- well, almost. Rifts® Ultimate Edition™ copyright © 1990, 2005 and Rifts® Primer copyright © 2016 Palladium Books Inc. and Kevin Siembieda. All rights reserved, worldwide, under the Universal Copyright Convention. "Palladium Books," "Rifts," "The Rifter," and "Megaverse" are registered trademarks, and "1st Apocalyptic Cavalry," "Archie Three," "Bandito Arms," "'Borg," "Bursters," "Chi-Town," "Coalition States," "Coalition," "Colorado Baronies," "Crazies," "Cyber-Knights," "D-Bees," "Federation of Magic," "Glitter Boys," "Golden Age Weaponsmiths," "Harvester of Souls," "Juicers," "Justice Ranger," "Ley Line Walkers," "Lyn-Srial Sky Knights," "Manistique Imperium," "MercTown," "Mind Melters," "New West," "Newtown," "Northern Gun," "Northern Gun," "Prometheus Treatment," "Psi-Cola," "Psi-Ghost," "Psi-Nullifier," "Psi-Slayer," "Psi-Slinger," "Psi-Stalkers," "Psyscape," "Simvan Monster Riders," "Titan Robotics," "Triax and the NGR," "Wellington," "Wilk's," "Zapper," and other names, titles, game terms, characters, character likenesses and slogans are trademarks owned by Kevin Siembieda and Palladium Books Inc. 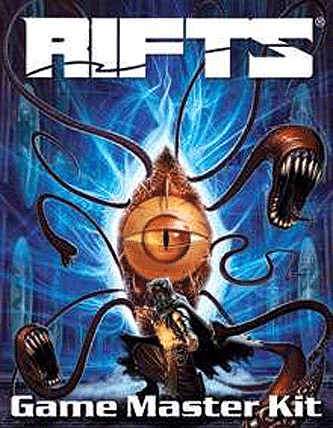 This updated, revised and expanded version of Rifts® Sourcebook One,™ one of the game's bestselling supplements, presents rules for robot creation and robot player characters (plus 20 robots from Northern Gun, Triax, and Titan Robotics); the inhuman villain Archie Three (a sentient computer from Earth’s past, and one of the most powerful beings in North America), along with his henchmen, robots, and a complete adventure that introduces him; the mysterious Republicans, humanity's salvation or destruction; the secret history of the Republicans, Archie, and North America; notable monsters and updates on their doings; and power armor, vehicles, weapons, miscellaneous equipment, and adventure ideas. The Republicans were first mentioned in the Rifts® RPG way back when it was first released in August 1990. However, they were never mentioned again. Why? Did I have some grand scheme for them? As it turns out, I sort of did, but truth be told, I had forgotten about them. Yep, I forgot I had ever mentioned the little buggers until, out of the blue, fans started asking me about them 10 years later. I went back, read the mention, checked my oid notes and vowed that I would bring them to life. As I worked on the Chaos Earth™ RPG I also hatched my plans for the Republicans. Ironically, presenting them now, a few years after Rifts® Chaos Earth™, works perfectly. Here's another personal tidbit. One of the cool things about writing fiction is that sometimes your characters and ideas take on a life of their own. When that happens, you, the writer, suddenly find the ideas running off on their own, and you feel more like an observer chronicling their story rather than the creator writing it. For me, it's as if aliens were beaming the story into my head and I'm just writing it all down as fast as I can before the transmission ends or I forget something important. It's awesome whenever that happens, and it seems to happen a lot when I'm writing about anything involving Archie Three, and by association, the Republicans . Their history, story and conflict with Archie just poured out of me and went in directions that surprised even me. Imagine, if you can, me pounding away at my keyboard, writing a mile a minute and saying aloud, "Holy crap! I can't believe it! Who knew!? The fans will freak!" I know, stupid, but true. Maybe it has something to do with the fact that I'm a fan of this stuff myself. Maybe it has to do with the writing process and tapping into the deepest comers of your imagination and losing yourself there. Or heck, maybe there really are aliens beaming these stories into my mind and I just let the words spill out onto paper. Whatever the process is, I hope you enjoy the end results. 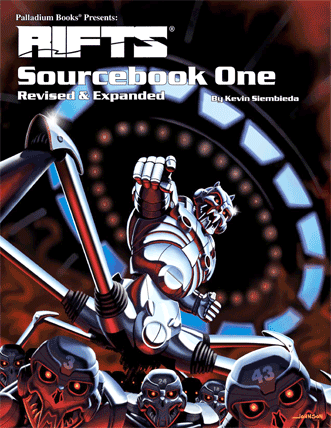 Rifts® Sourcebook One™ copyright © 1991, 2007 Palladium Books Inc. and Kevin Siembieda. All rights reserved, worldwide, under the Universal Copyright Convention. "Palladium Books," "Rifts," "The Rifter," and "Megaverse" are registered trademarks, and "1st Apocalyptic Cavalry," "Archie Three," "Bandito Arms," "'Borg," "Bursters," "Chi-Town," "Coalition States," "Coalition," "Colorado Baronies," "Crazies," "Cyber-Knights," "D-Bees," "Federation of Magic," "Glitter Boys," "Golden Age Weaponsmiths," "Harvester of Souls," "Juicers," "Justice Ranger," "Ley Line Walkers," "Lyn-Srial Sky Knights," "Manistique Imperium," "MercTown," "Mind Melters," "New West," "Newtown," "Northern Gun," "Northern Gun," "Prometheus Treatment," "Psi-Cola," "Psi-Ghost," "Psi-Nullifier," "Psi-Slayer," "Psi-Slinger," "Psi-Stalkers," "Psyscape," "Simvan Monster Riders," "Titan Robotics," "Triax and the NGR," "Wellington," "Wilk's," "Zapper," and other names, titles, game terms, characters, character likenesses and slogans are trademarks owned by Kevin Siembieda and Palladium Books Inc. The Game Master Guide collects all the weapons, equipment, body armor, power armor, robots, vehicles, skills and psionics from Rifts® World Books 1-22, Sourcebooks 1-4, and Siege on Tolkeen 1-6: 503 weapons, including explosives, plus E-Clips and ammo notes; 300 skills, 290 pieces of equipment, 104 suits of body armor, 182 vehicles, 86 suits of power armor, and 58 robots, along with maps, monsters, adventure ideas, a comprehensive index of O.C.C.s and R.C.C.s, experience tables for scores of character classes, a lexicon of terms, and more. The ultimate Rifts® reference: That is the idea behind this book. That's what you, our fans, have requested. Of course, putting it all together was not an easy task. The Rifts Megaverse® is infinite, limited only by one's imagination. The Rifts® world, war, dimension, conversion, and source books already in print only touch upon a fraction of those possibilities and number over 40 titles. Rifts® is a rich, exciting, and expansive playing environment, the likes of which have never quite been seen in gaming, but it has also gotten a bit unwieldy. The Rifts® Game Master Guide is designed to make the Rifts Earth environment more manageable. How? By presenting the crucial data and iriformation in one easy-to-manage reference book. This means we have collected all the skills, weapons, equipment, power armor, robots, vehicles, bionics, psionics, experience tables, combat and other data into ONE big reference book. We could not squeeze everything we wanted to include into this tome, even after going with nine-point type and 350 pages! But it does have the essentials. 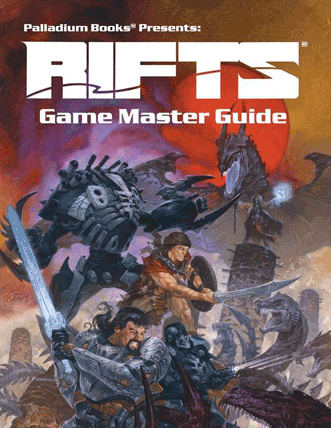 [...] The Rifts® Game Master's Guide is the ultimate reference to Rifts Earth, and reduces the need to lug around two dozen world books to run or play a Rifts® campaign to just a handful. Contributors to the Rifts® Game Master Guide include Kevin Siembieda, Wayne Breaux Jr., C.J. Carella, Bill Coffin, Christopher R. Kornmann, Michael Leonard, Ben Cassin Lucas, Peter Murphy, Patrick Nowak, Francois DesRochers, Mark Sumimoto, and Erick Wujcik. Rifts® Game Master Guide copyright © 2001, 2000, 1999, 1998, 1997, 1996, 1995, 1994, 1993, 1992, 1991, and 1990 Palladium Books Inc. and Kevin Siembieda. All rights reserved, worldwide, under the Universal Copyright Convention. "Palladium Books," "Rifts," "The Rifter," and "Megaverse" are registered trademarks, and "1st Apocalyptic Cavalry," "Archie Three," "Bandito Arms," "'Borg," "Bursters," "Chi-Town," "Coalition States," "Coalition," "Colorado Baronies," "Crazies," "Cyber-Knights," "D-Bees," "Federation of Magic," "Glitter Boys," "Golden Age Weaponsmiths," "Harvester of Souls," "Juicers," "Justice Ranger," "Ley Line Walkers," "Lyn-Srial Sky Knights," "Manistique Imperium," "MercTown," "Mind Melters," "New West," "Newtown," "Northern Gun," "Northern Gun," "Prometheus Treatment," "Psi-Cola," "Psi-Ghost," "Psi-Nullifier," "Psi-Slayer," "Psi-Slinger," "Psi-Stalkers," "PsyScape," "Simvan Monster Riders," "Titan Robotics," "Triax and the NGR," "Wellington," "Wilk's," "Zapper," and other names, titles, game terms, characters, character likenesses and slogans are trademarks owned by Kevin Siembieda and Palladium Books Inc. This is the ultimate guide to magic for Rifts Earth: all the spells, tattoos, Techno-Wizard items, magic weapons, equipment, body armor, restraints, parasites, symbiotes, items, armor, automatons, Iron Juggernauts, and more from Rifts® World Books 1-23, Sourcebooks 1-4, and Siege on Tolkeen 1-6, collected in one big reference. Man oh man, the Rifts® Megaverse® is big. You would think, as the guy who has written 80% or more of Rifts® and overseen every book in the Rifts® RPG series, that I would realize just how big Rifts® really is. Yet somehow even I lost track of its sprawling magnitude. Believe it or not, when I had Bill Coffin start compiling the Rifts® Game Master Guide (another nine-point, 300+-page reference book) we both, foolishly, planned to include all the magic spells in it. We must have been crazy or overworked, or a little of both, because we could barely squeeze all the magic into one big book of its own! Well, the scope of magic on Rifts Earth became evident as Bill gathered material for the GM's Guide -- there was just no way to include even a comprehensive list in the Guide. So I quickly decided to give magic its own book. I had Bill collect it all, I organized it and added a few bits and pieces, and here you go, the Rifts® Book of Magic: a companion to the Rifts® Game Master Guide released just a few weeks earlier -- a vital sourcebook on magic for Rifts Earth. We certainly tried to cram everything about magic we could squeeze into one volume in the Rifts® Book of Magic -- everything short of the Dimension Book magicks and the kitchen sink. This way players as well as Game Masters have only one book to use to find spells galore, rituals, magic weapons, rune weapons, Techno-Wizard devices, charms and talismans, Necromancy, Whalesongs, and a whole slew of magic items. Magic vehicles have been included, as well as an Index of Practitioners of Magic, various aspects to magic, and a lot of new artwork to depict more spells in order to help convey how they work. We hope this Rifts® Book of Magic helps to make your playing experience more fun and easy. Contributors to the Rifts® Book of Magic™ include Kevin Siembieda, Wayne Breaux Jr, CJ Carella, Bill Coffin, Hugh King, Christopher R. Kornmann, Peter Murphy, Patrick Nowak, Steve Sheiring, and Mark Sumimoto. 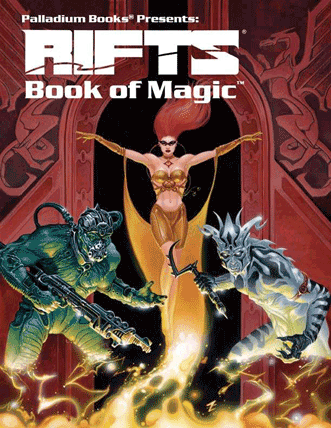 Rifts® Book of Magic™ copyright © 2001, 2000, 1999, 1998, 1997, 1996, 1995, 1994, 1993, 1992, 1991, and 1990 Palladium Books Inc. and Kevin Siembieda. All rights reserved, worldwide, under the Universal Copyright Convention. "Palladium Books," "Rifts," "The Rifter," and "Megaverse" are registered trademarks, and "1st Apocalyptic Cavalry," "Archie Three," "Bandito Arms," "'Borg," "Bursters," "Chi-Town," "Coalition States," "Coalition," "Colorado Baronies," "Crazies," "Cyber-Knights," "D-Bees," "Federation of Magic," "Glitter Boys," "Golden Age Weaponsmiths," "Harvester of Souls," "Juicers," "Justice Ranger," "Ley Line Walkers," "Lyn-Srial Sky Knights," "Manistique Imperium," "MercTown," "Mind Melters," "New West," "Newtown," "Northern Gun," "Northern Gun," "Prometheus Treatment," "Psi-Cola," "Psi-Ghost," "Psi-Nullifier," "Psi-Slayer," "Psi-Slinger," "Psi-Stalkers," "PsyScape," "Simvan Monster Riders," "Titan Robotics," "Triax and the NGR," "Wellington," "Wilk's," "Zapper," and other names, titles, game terms, characters, character likenesses and slogans are trademarks owned by Kevin Siembieda and Palladium Books Inc. This kit makes your job as a Rifts® Game Master easier. The kit includes character sheets, a Game Master Reference Sheet and G.M. Log, Combat Matrix, Skill List, alphabetized Spell Sheet, 'Borg Worksheet, and 20 complete sample characters to hand out to players or use as NPCs. Game Master Reference Sheet -- This is a cheat sheet for the Game Master. Vital Game Master information is available at your fingertips. • Rifts® Combat Matrix -- This useful Game Master aid will allow you to streamline combat in your game, organize initiative rolls and easily keep track of number of attacks. • Rifts® Skill List -- Need to look up a skill percentage or even W.P. bonuses? This is not only a useful Game Master tool, but an excellent aid when creating characters. • Alphabetized Spell Sheet -- This quick reference for magic users lists all spells that are currently in print in the Rifts® Book of Magic, along with the page number. Again, this is another dual purpose aid for both Game Masters and players. • 'Borg Worksheet -- Need to design a 'Borg as a pre-generated character? These worksheets allow you to customize your 'Borg character and easily keep track of all of the 'Borg’s cybernetic and bionic enhancements. • Rifts® Mini-Posters -- The mini-posters can be used to advertise the game you are running at your local store or convention. Post them at your table or where allowed at the convention. Finally, if anyone is interested in receiving Weekly Updates and Press Releases from Palladium, have them write down their email addresses and pass the list along to Palladium Books. • Rifts® Character Sheets & G.M. Logs -- These are the classic character sheets, G.M. Experience Log, Mercenary Company Sheet, Robot Combat/Vehicle Log and Traveling Show Creation Sheet. They're up on our website, but we thought we'd save you some time and include them here. • Rifts® Sample Characters -- 20 complete characters to hand out to players, use as NPCs, etc. Rifts® Game Master Kit copyright © 2011 Palladium Books Inc. and Kevin Siembieda. All rights reserved, worldwide, under the Universal Copyright Convention. "Palladium Books," "Rifts," "The Rifter," and "Megaverse" are registered trademarks, and "1st Apocalyptic Cavalry," "Archie Three," "Bandito Arms," "'Borg," "Bursters," "Chi-Town," "Coalition States," "Coalition," "Colorado Baronies," "Crazies," "Cyber-Knights," "D-Bees," "Federation of Magic," "Glitter Boys," "Golden Age Weaponsmiths," "Harvester of Souls," "Juicers," "Justice Ranger," "Ley Line Walkers," "Lyn-Srial Sky Knights," "Manistique Imperium," "MercTown," "Mind Melters," "New West," "Newtown," "Northern Gun," "Northern Gun," "Prometheus Treatment," "Psi-Cola," "Psi-Ghost," "Psi-Nullifier," "Psi-Slayer," "Psi-Slinger," "Psi-Stalkers," "Psyscape," "Simvan Monster Riders," "Titan Robotics," "Triax and the NGR," "Wellington," "Wilk's," "Zapper," and other names, titles, game terms, characters, character likenesses and slogans are trademarks owned by Kevin Siembieda and Palladium Books Inc.